The advanced medical hair tattoo to hide hair loss. Scalp MicroPigmentation (SMP) & microblading is a permanent cosmetic “tattoo” that mimics the very short hairs of a closely shaved scalp or a short-buzzed haircut under 1mm. It is a new and innovative technique that offers an alternative styling option if you do not want or are not a candidate for hair transplant surgery. Scalp MicroPigmentation is a non-surgical cosmetic treatment for hair loss. SMP also be used to conceal scars. Some people who are not good candidates for hair transplant surgery often choose SMP to create the illusion of a full head of hair. SMP can also be used to conceal the linear scar after a Follicular Unit Transplantation procedure. Is Scalp MicroPigmentation Worth It? Thousands of men and women who are trapped with their thinning hair or a botched hair transplant scar will testify that Scalp MicroPigmentation is a life-changing experience. (see our Real Self reviews). 1. A Bold, Shaved look – You don’t have to hide under your hat! 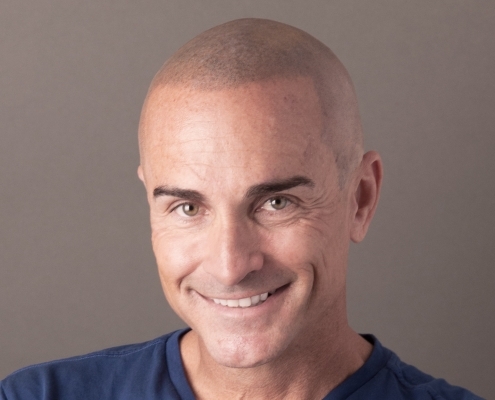 A clean, shaved, or buzzed haircut can help you look and feel younger. SMP mimics a five o’clock shadow, so the horseshoe-shaped bald pattern can be covered. 2. Thinning Hair – You don’t have to worry about the wind, getting your hair wet in the pool, or standing under a bright light! SMP can work as a permanent concealer for thinning hair. SMP can diminish the contrast between hair and skin. Many temporary topical powders or fiber concealers such as Dermmatch, Toppik, and Caboki work well, but they can be messy. You cannot sweat or get your hair wet because the product will come off. Just as your hair always looks better in dim evening shade, SMP creates a permanent shade effect on your scalp. 3. Scalp Scars – You don’t have to worry about standing in front of the line or sitting in the front row because you are concerned someone will see your hair transplant scar. SMP can work to disguise the pale scar on the back of your head from a strip surgery, or hide the blotchy dots from an FUE surgery. You can wear your hair shorter without worrying about someone noticing your scar. SMP is like a tattoo in that the pigment is deposited under your skin surface in the dermal layer of skin. The dermal layer of skin is the permanent layer. However, unlike a traditional tattoo, SMP is deposited in the upper dermal layer (just deep enough to make it permanent). A traditional tattoo is deposited deep into the dermal layer. The shallow application is what makes the SMP appear more like a hair follicle (5 o’clock shadow) and not a blob of tattoo ink. Unfortunately, the shallow depth can also push the SMP pigment up to the skin surface and can result in fading over time. Some patients may want a touch up after a few years. How real does SMP look? SMP is obviously not real hair, but it can closely mimic the 5 o’clock shadow of a shaved scalp. 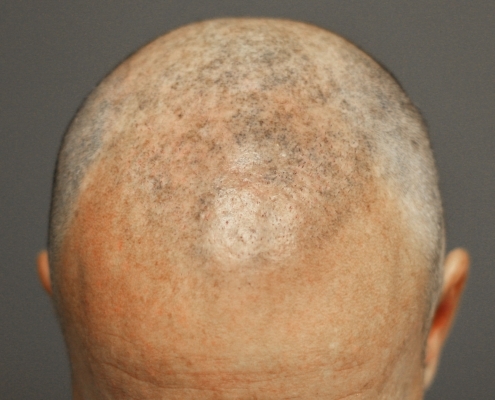 If you keep your scalp shaved, SMP can look undetectable even up close. Of course, the quality of work depends on the skills of the physician and their surgical staff as well as the pigment. It is an art form as much as it is a technical specialty. Can I finally wear my hair short and hide my hair transplant scar? The answer is not so simple. We realize you may want to have the SMP procedure so you can wear your hair short without worrying about your hair transplant scar showing through. SMP can disguise your linear hair transplant scar or patchy FUE scars, but there is an important limitation. You cannot keep your hair too short or the shape of the scar will show through like a line or a step in the contour of your hair. In addition, in certain lighting conditions and angles, the scar will be apparent to the discerning eye. Keep in mind that you are seeing the SMP pigment under a layer of translucent skin, so you cannot expect it to replace the feeling of a hair shaft as it grows. In other words, SMP is not a substitute for real hair. When your scalp is shaved or your hair is very short (1mm), SMP will blend in and disguise the scar. However, as your hair grows out past 1mm, the texture of your hair will not match with the flat SMP layer. You will notice a gap. Topical products that contain alcohol (Rogaine, hairspray, etc). Intrinsic fading: About 10% of our patients have this issue. Unfortunately, you cannot do much to avoid this type of fading. Natural exfoliation of the skin. Everyone naturally exfoliates. Your body’s immune system will always try to remove foreign particles such as SMP pigment. Some parts of the scalp fade faster than other parts (even without any scarring). Patients have different experiences with the degree of fading due to the reasons listed above. In rare cases, the SMP seems to fade much faster than the average patient. When this happens, touch-ups are required more frequently. To avoid extrinsic fading, you should find the best SMP provider using quality pigments and avoid sun and products containing alcohol. You cannot completely avoid intrinsic fading. To address intrinsic fading, you may need more SMP sessions or touch-ups than the typical SMP patient. Most patients do not need a full touch-up for several years. About 10% of patients may need a touch up every year due to the fading. In rare cases, we may have to try different brand pigments, or apply the SMP much deeper (like a regular tattoo), which may cause it to look blotchy. What is the difference between SMP and a regular tattoo? SMP is like a tattoo in that the pigment is deposited under your skin surface in the dermal layer of skin. The dermal layer of skin is the permanent layer. However, unlike a traditional tattoo, SMP is deposited in the upper dermal layer, so it is deep enough in the skin to make it permanent. The shallow application is what makes the SMP appear more like a hair follicle (or 5 o’clock shadow) and not a blob of tattoo ink. A traditional tattoo, on the other hand, is deposited deep into the dermal layer. Is SMP a hair tattoo? As Scalp Micropigmentation has gained popularity over the years, it is also synonymously known as a hair tattoo. Can SMP be done along the hairline? Yes, SMP can be used to define the hairline. Some of our patients request a natural, soft hairline while others ask for a linear hairline. Each and every patient’s preference is different, and we try our best to accommodate their goals. If your goals and expectations are unreasonable, our doctor will let you know. Can SMP be done for beard or facial hair? Yes, we offer SMP for the beard to achieve a fuller and thicker look or to conceal a scar. We can even create a permanent 5 o’clock shadow. Can you match my skin pigmentation? Our physicians use SMP pigment to create a shadow effect much like a 5 o’clock shadow. We do not match your skin or hair color. This will ultimately work in your favor as your SMP result will not be affected when your hair turns grey or if you change your hair color. Can SMP be done in conjunction with a hair transplant? Yes. Our physicians have performed numerous SMP procedures in combination with hair transplants. However, they cannot be on the same day. When you combine SMP with a hair transplant, you can achieve the look of fullness with the SMP while having the real texture of a hair transplant. Do I need to shave my head before each SMP session? No, you do not need to shave your head before each SMP session. We recommend you wear your hair at your desired styling length so our physicians and technicians can blend the SMP into your hair. How long is each SMP session? Each session can last between 4 and 8 hours. You can resume normal daily activities after your SMP session. However, if you choose to have the optional light sedation during your SMP, you may feel tired or sleepy for the remainder of the day. What is the average time between SMP sessions? We recommend that our patients wait a minimum of 2 weeks between sessions. This allows enough time for the skin to exfoliate. The interval between each session will be custom tailored to your scheduling needs. There is no issue with waiting longer than two weeks in between sessions. Scalp Micropigmentation is like a tattoo, and it should be lifelong. But just as a tattoo fades over time, so may SMP. Each patient will experience some degree of fading. In our experience, after a 5-year follow-up, 4 out of 5 patients are satisfied with their results and do not need or want a touch-up. However, there are discerning patients who request a touch up after 1-2 years. Does Scalp MicroPigmentation look real? SMP blends in with the thinning or balding areas on the scalp. With the right technique of a skilled surgeon or technician, you cannot tell that someone has had SMP, even up close. While photos on our NHI Medical site are great examples of our work, we invite you to see SMP results in person at our monthly Open House Event. You can also witness an SMP or hair transplant (FUE or FUT) procedure as it is taking place to understand more about the process. Most of our patients do not mind sharing their experience or letting you examine their results in person. One might be skeptical of why someone would freely share their personal experience. We find that the overall experience at NHI Medical is life-changing for those who have been obsessed with their hair, have had a bad hair transplant, or have had a scar for most of their adult life. Many of our patients finish their SMP procedure with a sense of gratitude and bond with the NHI Medical staff and physicians. Attending the open house and being available to show potential patients their results are their ways of paying it forward to others who are in their situation.